Chef Edward Lee loves hole-in-the-wall restaurants serving overlooked Asian cuisines. Here are three of his favorites, with his versions of their specialties. My food has always been informed by the flavors of Asia. Unfortunately, I don’t get to visit there as often as I would like, but I’ve discovered that I can get a secondhand yet valuable education in Asian cuisine by eating at small and largely unheralded restaurants around the US. Often run by immigrants and simply (sometimes inexplicably) decorated, these places offer great value, and I always leave sated—happy, even—with a lingering spice burn on my tongue. I usually go alone, take notes and gobble down a full meal before heading to a much fancier restaurant for yet another full meal (research!). These Asian spots give me a different kind of inspiration, the kind that almost always leads to ideas for the menu at my restaurant. 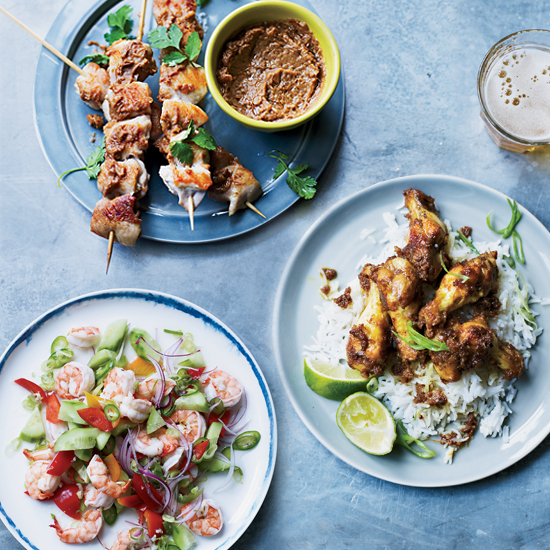 The recipes here reflect three cuisines most Americans have yet to discover: Indonesian, Filipino and Cambodian. I was driving to meet friends at a trendy L.A. restaurant when I passed Ramayani, which sits on a lonely block in Westwood. I was curious, so I stopped in, and a quick bite turned into five full dishes. Indonesian cuisine is challenging to describe: It combines Indian, Middle Eastern, Chinese, Spanish and Portuguese influences. I fell in love with the tangy, peanutty dressing that came with a blanched-vegetable salad called gado gado. I wanted to take this dressing and pour it over something with more flavor and texture—chicken skewers, beef satay, even a warm bowl of noodles. This is often how I reimagine a traditional dish: I pilfer one element and combine it with new ones that I know will taste delicious together. 1777 Westwood Blvd. ; ramayani.com; 310-477-3315. Some of the best Filipino food I’ve ever had—a unique blend of Southeast Asian flavors with Spanish, Chinese and Indian influences—is served at Kusina Filipina, a small, family-run place on Beacon Hill in Seattle. Kusina prepares excellent versions of traditional dishes like longganisa (a sausage similar to chorizo), and because of Seattle’s proximity to the ocean, they sometimes offer a dish called kinilaw, a Filipino version of ceviche. They use vinegar and lime juice to “cook” the fish—usually tuna—and then add lots of fresh garlic and ginger. I’ve adapted the recipe for shrimp because I prefer its texture. 3201 Beacon Ave. S.; kusinafilipina.net; 206-322-9433. When I heard about a cluster of Cambodian restaurants popping up around Lowell, Massachusetts, I made a special trip to check out one of the most acclaimed spots, Senmonorom. It serves traditional Khmer cuisine, which is similar to that of neighboring countries Vietnam and Thailand, but with roots in China and India. Here, I’ve simplified their traditional red curry—generally milder than the Thai version—and used it as a sauce for a Cambodian version of buffalo chicken wings. 1671 Middlesex St.; senmonoromrestaurant.com; 978-275-0024.